The plan was simple. 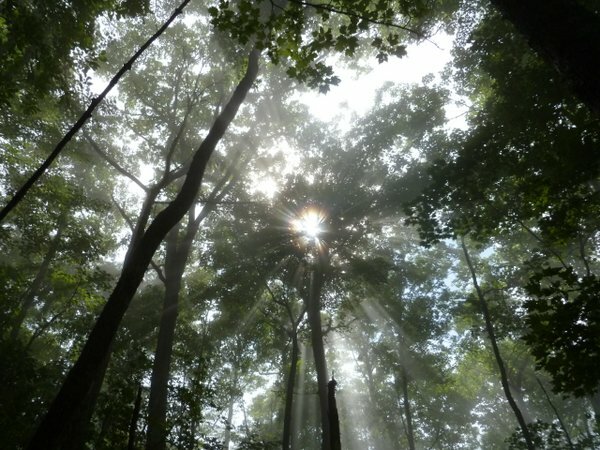 This past Friday (which I would like to point out did happen to be the 13th) a group of us would meet at the Nantahala Outdoor Center (NOC) around 7 am. Once we were a collective group, we would all pile in one vehicle and then head to the Fontana Dam. From there we had a nice, simple 2.5 day hike southbound along the Appalachian Trail to the NOC. Upon our arrival back at the NOC, we would devour a Boathouse burger, fries and a beer from The Rivers End restaurant, and then we would all go back our separate ways. Joslyn (from UltraLight Backpacking or Bust!) stayed at the Smokemont Campgrounds in the Great Smoky Mountain National Park the night before and then would simply drive up to the NOC the next morning. Brian simply got up early enough that morning to drive from his home to the NOC. Charlie (AKA: Hiking Shoes) planned to drive up from a nearby job site in GA. I left my house the day before and drove to Gizmo Joe’s house and stayed the night. Then we got up early the next morning and would drive to the NOC. I got a FaceBook message from Hiking Shoes on the way to Joe’s house saying that he was probably not going to make it, but he was going to let me know sometime after midnight if he would be there. As well, Joslyn called me and informed me that she had gotten a little burn on her hand while at the camp that night, but for the moment was ok. I got to Joe’s house a little after 11 pm and then of course we sat up until almost 2 am talking about all things associated with backpacking… Then at 5 am we were leaving his house. Charlie had messaged me again saying that he was not going to be able to make it. When Joe and I arrived at the NOC around 8:30 we fund Brian, Joslyn and her husband waiting on us. Once we all introduced one another we found out the Joslyn would not be heading down the trail with us either. The burn on her hand had made her feel slightly nauseated and did not want to start the hike not feeling good. However, we stayed for a bit and talked with Joslyn about all things backpacking and she showed us some of her awesome projects (such as a DIY hammock, pillow, top quilt and bottom quilt). I must say that we were all impressed at her skills with a sewing machine. The items looked no less than something you would expect from a professional service. I immediately noticed that I had left my Gatorade bottles in another bag, which was in the back of my truck at the NOC! Thankfully the visitor center at the dam sold the 20 oz bottles of Powerade so I made my way back down and bought two. Then as I came back up I realized that the small bottle holders that I am so proud of were also around the necks of my long gone Gatorade bottles… So, Joe cut me a few small pieces of spectra and donated a second mini carabiner to me to make some up real quick. The problem though, was where did we start? There was a small trail in the front of the shelter that was not marked and just didn’t look right, but there was nothing else, nowhere. From here, let me just say it was about 30 minutes before we found out where the trail really was…and for those of you interested, it is not anywhere near the shelter. It is actually back up at the road and follows the road for a ways before cutting back into the woods. At almost 3,000 feet of gain in 3 miles, the climb out of Fontana is a bit of a steep climb. Leg’s burning and chest’s heaving, we slowly made our way up the mountain, with barely enough breath left to continue a conversation. As we moved along, we would take turns leading, which really means eating the spider webs. The small bit of rain that we experienced at the marina turned out to be very short-lived, and as we moved higher up the mountain it just seemed to get hotter, and with more humidity. Then, a couple of miles up, as the trail was winding back around we came to a nice little stream. Joe was in the lead with Brian in the middle and I was at the end. As I was just saying I was going to refill some water I heard Brian yell out and slap at his right calf. Turns out there was a yellow jacket nest under a rock on the trail and as Joe walked over it, they got stirred up and got the next person through. I saw the yellow jackets flying in and out of the hole in the ground so I quickly made my way up and decided against the water refill (I still had plenty anyway). After a while we decided to stop, pull our shoes off (and even to mod Brian’s pair) and have a snack for a bit. This was a nice stop. The hike up so far had been rather challenging, so a short rest and fueling was a good idea. From this point, the hike continued on as a typical hike does. We made it to Cable Gap Shelter and took our packs off again. We also ate some more of our trail food and this time we did refill our water. 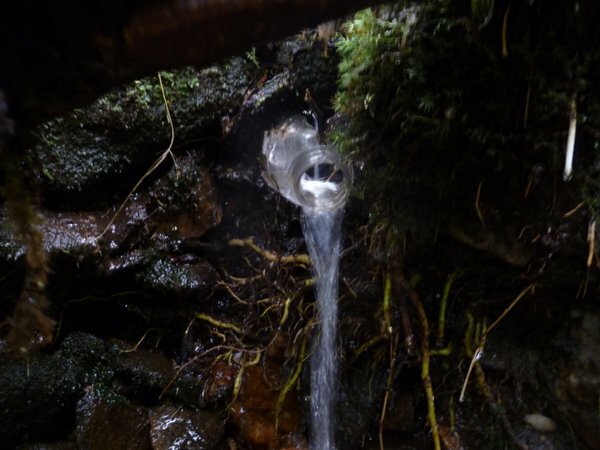 There was a nice little water source in the front of the shelter, and someone made good use of an old Gatorade bottle as a spout for the water to flow through, which made it quite easy to refill our water. This was a fun stop because we got to get some gear out here to filter our water. Joe used his trusty MSR Sweetwater filter, which turned out to have a clogged prefilter. Brian used a cut down piece of diesel fuel filter (which filters to 0.1 micron), and of course I used my Sawyer Squeeze. So, it was definitely fun to get to check out some different water filtering methods. After filling water, resting and eating, we left the shelter to finish up the next 6 miles of the hike for that day. 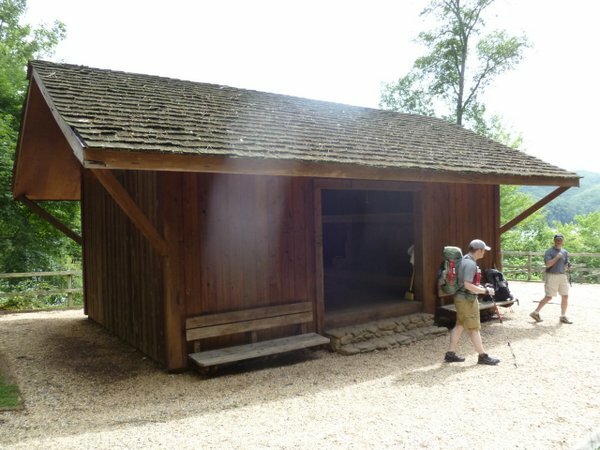 We arrived at Brown Fork Gap Shelter later that evening, and I gotta say, it was nice to see the shelter. The humidity was really making it hard to hike, so it was nice to be done for the day. As we got spread out at the shelter we decided to all stay inside the shelter since there were not good spots to really set-up our shelters. At this point we all got to check out each others gear a little better, so this was cool too. Brian had decided to do a no-cook hike, do once we were settled in a little and had collected more water, Joe and I set up our stoves and began preparing our food. Joe used his tried and true cat stove with a titanium snow peak bowl as a pot. He brought his water to a boil and dined on a Mountain House Meal for the night. 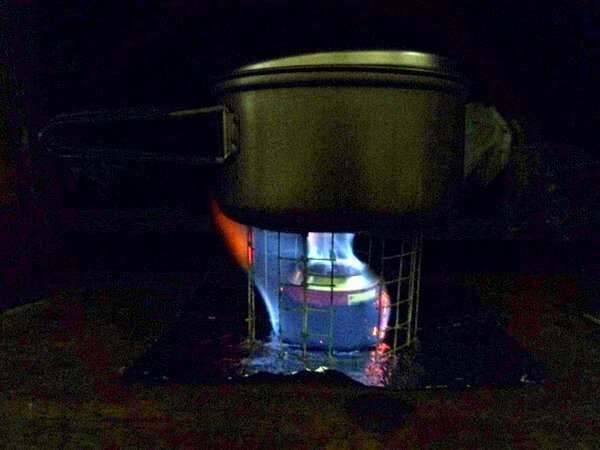 I used my cool new Picharpak Workshop JC250 Alcohol stove and a 0.9L Evernew cook pot to boil my water, and then added in my Pad Thai meal. While our water was coming to a boil we carried on about some other camp chores. Brian went ahead and threw the bear line since this shelter did not have a bear cable system set-up, and I collected some more water to do some Ziploc bag laundry with. 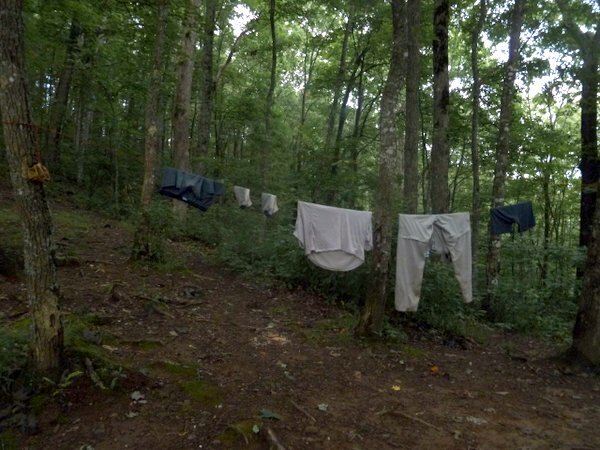 Once we were done eating we cleaned up our kitchen areas, hung our clothes over a line that happened to be left up between some trees, and then went to hang them on the bear line. We decided to throw one bear line and hang all of our lines from it. We all had some rope, but I asked Brian to throw the H Line dyneema cord from LiteTrail which I had brought along to use. Once we got all of the bags attached and began hauling them up though we found out that the particular limb we used was not going to be able to hold them all up. So, we pulled it down and threw it over another branch. This was fun as it was getting dark and we were using our headlamps to help us see where we were throwing the line. We each took a few tries and then finally got it. So, again, we hooked our bags up and began to haul them up, but then they came crashing back down on us. This branch turned out to be dead. So, we tried again. The next branch that we threw the line over turned out to work out just fine. It was both big enough to hold the weight, as well as live enough not to break! Once we got it up in place, Brian tied the other end of the line off and we headed back to the shelter to get our sleeping set-up, set-up. Despite not setting up our “shelters” and instead staying in the trail shelter, we each decided to use a part of our shelter system inside the shelter. 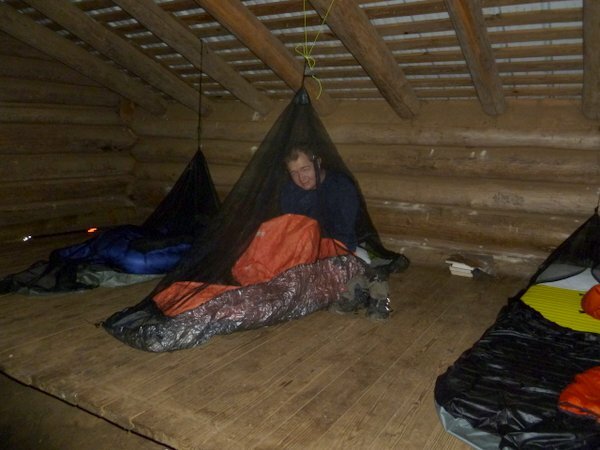 Brian used his MLD Bug Bivy and tied it off to the rafters above in the ceiling. 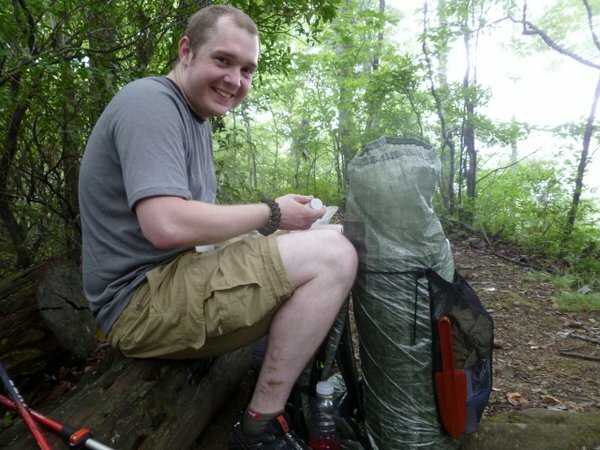 Joe used his ZPacks Hexanet and tied it off the same way. 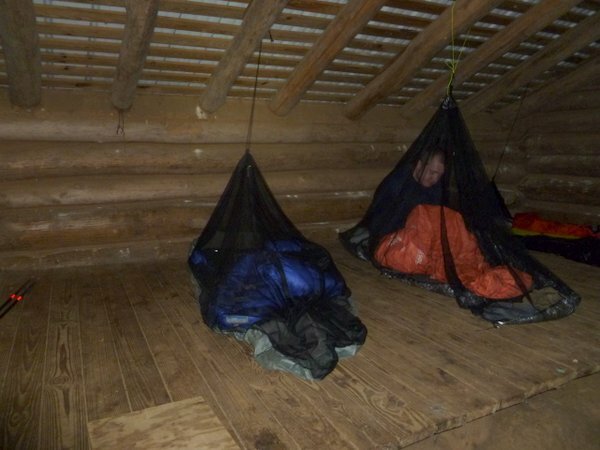 I pulled out my brand spanking new Borah Bivy and also rigged it up to the rafters above me the same way. However, it was still hot… Even though Brian and Joe’s set-up’s consisted of an all mesh top, they were even feeling the heat. I climbed inside my Borah Bivy and just laid under the actual M50 top, but in the end, this proved to be too hot too. I ended up lying on top of the bivy with my quilt beside me. The night did cool off some, but the humidity was still thick and made it hard to even get close to being comfortable. I would pull my quilt over me a bit and then have to pull it back off. Eventually I did make it back into the bivy and let the M50 top lie over me again, and this worked ok.
Once morning came we all were up fairly early (due to the heat) and then carried on with typical morning camp chores. We retrieved our food bags, then Joe and I boiled some water for our breakfasts. We ate, cleaned up and then began packing our bags back up. Of course we were happy to find our clothes still hanging on the line undisturbed, however, putting the cold, damp clothes back on was not so much fun, at least for a moment. A little while later, we were all packed up, made our last use of the privy and double checked for anything we may have left behind. Leaving the shelter we immediately began climbing up again, however, this time it was for a much shorter time. 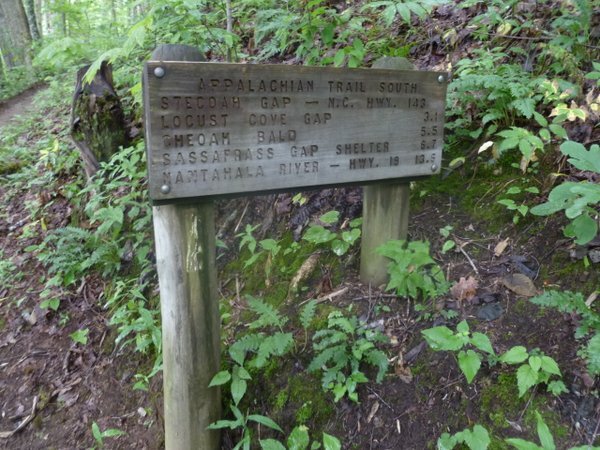 It was not too long when we had actually hiked out to Stecoah Gap and decided to take our first break at the picnic tables beside the road. While sitting here an elderly couple walked up from behind us from a Birding Trail. They stopped and we talked with them for a while. Turns out that they had maintained parts of the very trail that we were on for a number of years, but had stopped a couple of years back, so they were able to fill us in on some details. After saying our goodbyes, we decided to continue our hike. At this point, we only had about 6 miles to go to get to our shelter for the night, Sassafras Gap Shelter. As we hiked up out of the gap we ended up meeting the first hikers on the trail since we had started. The first lady we came to went by the name Energizer Bunny. We talked with her for a bit and found out that it had poured on them the night before at their shelter, although it never did rain on us. Before she continued on she told us that there were 3 others with her group, but they were somewhere behind her. As w continued hiking we did eventually come to each of the other hikers, one-by-one, spaced out along the trail. Before meeting the last hiker though, the rain came. Once we realized that this was actually rain and not just water falling from the overhead limbs, we decided to make sure everything was safe in our packs and just decided to hike in the rain sans rain gear. And I have got to say, this turned out to pretty nice. The rain was cold and helped to cool me down, almost to the point that I was getting a little chill. Nothing serious considering the temps, but it was surprising at how cold the rain actually was. The rain came down hard for about 10 minutes, and then it began letting up. Sometime during all of this we also met the 4th hiker from the group. As the rain was coming to a stop we summited a small peak and stood there, taking a break and listening to Brian tell us about some watches that he himself had designed. After listening to him talk about this subject, I have decided that not only with backpacking gear, but I will also consult with him if I ever decide to get a watch! The look of instant understanding dawned upon their faces, probably as I imagined it did my own as well, just a few seconds before… We had left my truck at the NOC. When we finished the hike I was going to drive Brian back to Fontana Dam to get his truck…but this was not the case now… I did not have my keys. The key to a successful hike: Have them! So, this was the end of our hike. We made it back to Stecoah Gap and by the time we made it, we only waited for a short time for our ride. Once he arrived, we all piled in his truck and headed back down to Fontana Dam to get Brian’s truck, and my keys. Once this was done we all decided to head back to the Rivers End restaurant and have that Boathouse burger, fries and a beer just like planned to finish the hike off. 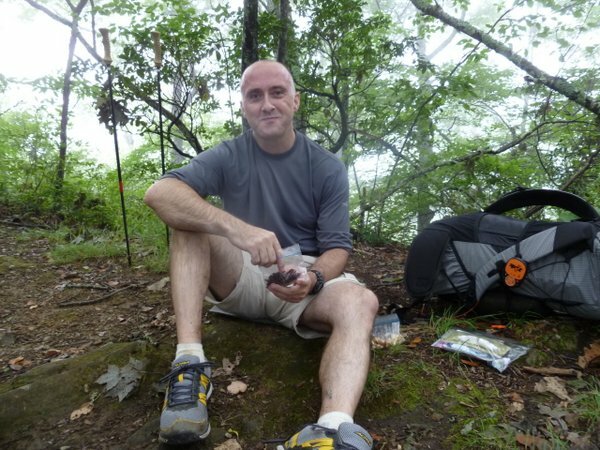 This entry was posted in Blogs, Trip Report and tagged Appalachian Trail, AT, Backpacking, Brian's Backpacking Blog, Brown Fork Gap Shelter, Cable Gap Shelter, Evernew Cook Pot, Fontana Dam, Fontana Dam Shelter, Hiking, LiteTrail, Nantahala Outdoor Center, NOC, Picharpak Workshop, Sassafras Gap Shelter, Ultralight Backpacking or Bust!. Bookmark the permalink. 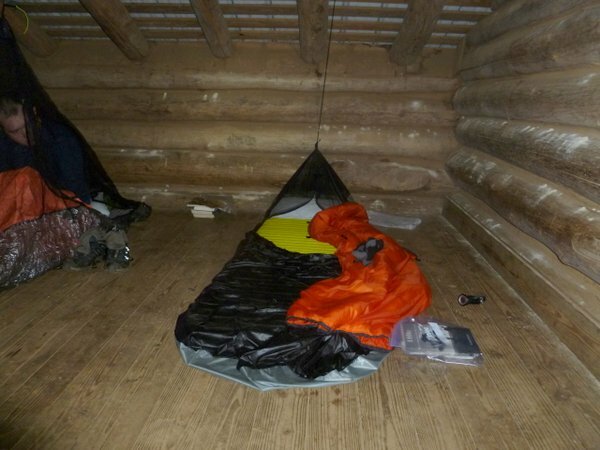 Are you planning to do a video review of the Borah Bivy? Thanks for the info Stick. Ah that’s tough, try making a checklist next time to review when you leave your house and again when you leave your vehicle. I hate it when you’re all ready to go then realize you forgot something! Was there more water available on the trail? Looks like there has been some rain in the area. 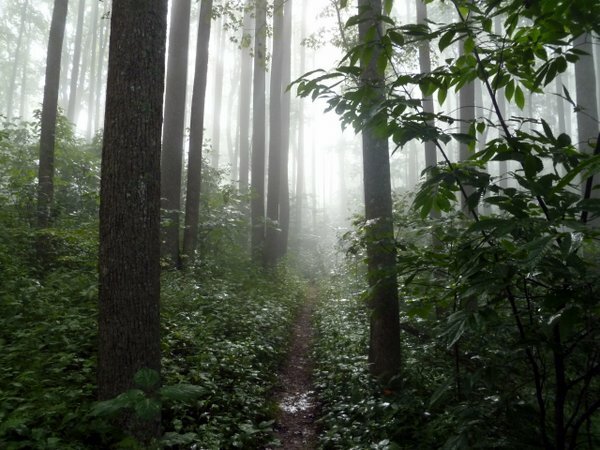 I’m still planning to hike Winding Stair Gap to NewFound Gap the first part of August. Any tips for using the squeeze filter? As for using the squeeze, I suggest back-flushing and cleaning it as suggested after every hike, even a day hike. When you use the squeeze bags, I like to roll from the bottom down rather than squeezing the bladder. Rolling will result in less stress to where the mouth is attached to the bag. I also like to add a carry/hang string to the bottom of the bag. And be sure to bring a large Ziploc bag for when you need to scoop the water from puddles. Good luck on your hike and have fun! Nice hike despite all of the “stuff.” Thanks for the write up. Thanks for checking it out Jim! It was a great time. Maybe next time we all get together you can make it with us! Foothills Trail last week of September? Great trip report! It’s nice to see that the pro’s still have hiccups no matter how much they try to plan things. I’m excited to reach the point where I can feel confident I can navigate such problems safely and effectively. Haha… Pros… maybe the other guys on the trail, but I wouldn’t call myself a pro… But I will admit it was a great time! Mishaps turn a trip into an adventure. Despite all the mishaps, it sounds like everyone had a good time. I’ve had things like that happen and at first I was mad and felt horrible, but they always make for a good story…and good memories! I think that we all had a good time, despite the mishaps. But I agree, I really wanted to kick my own tail for forgetting my keys… but yeah, I think it made for an interesting blog post too! Haha yea the filter is good now……I will say that the pre-filter is about 11years old and needs to be replaced, but once I figured that out it worked as good as new! Also I have to say that the MSR Sweetwater is one of my favorite filters on the market due to its simplicity and MSR aka Cascade Designs really stand behind what they make and I highly recommend them it that means anything haha. Yea………..it will have to be a day hike sometime haha………..I cant wait to help plan the next Hike of Awesomeness for the 3 Stooges!!! It was an Awesome trip for sure! I cant wait till the next one……..and one day I might actually get to hike those 3 miles haha………………. All I have to say is you have no luck with water filters, Joe! Haha, @jermmsoutside put it well 🙂 You’re due for a “bluebird” trip. I don’t know, winging it looked like fun… right up to that moment you realized where your keys were!